my resource library. my connection to others. my ongoing support. helping me learn. No matter where you are in your journey, being well-informed can help you create a plan as you move forward. So learn as much as you can from your healthcare team — they’re the best source of information about your rare disease and its treatment — but also look to OnePath to continue your education. Select a condition below to get started. This site is intended for a U.S. audience. The contents of this site are not intended for the purpose of disease diagnosis or as a substitute for information that is provided to you by your physician. You should always discuss your medical condition and any questions you have with your doctor. Most people have 4 parathyroid glands located behind the thyroid gland in the neck. The glands release parathyroid hormone (PTH), which controls the levels of calcium and vitamin D in the blood. Hypoparathyroidism is a rare disorder that occurs when the parathyroid glands are damaged either due to surgery or a disorder and are not able to produce enough PTH. In some patients, doctors are not able to tell the cause of hypoparathyroidism. Not having enough PTH can interfere with functions of the intestines, kidneys, and bones. This is the most common cause of acquired hypoparathyroidism. 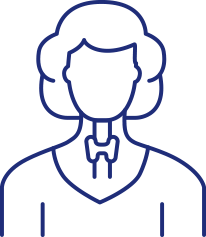 People who have surgery to treat diseases or conditions near the parathyroid glands are at risk for accidental damage or removal during the procedure. This is the second most common form of hypoparathyroidism in adults. In this condition, the immune system creates antibodies in an attempt to reject parathyroid tissues as if they are foreign bodies. Also known as familial hypoparathyroidism, this occurs when the parathyroid glands are either not present or don’t work properly at birth. This is the term doctors use when the cause is not known. Talk to your doctor about low blood calcium due to hypoparathyroidism. If your doctor suspects you may have hypoparathyroidism, he or she will ask for your medical history, including your symptoms, past neck surgery and family history. Your doctor will also conduct a physical exam to check for symptoms. Your doctor will also conduct lab tests to evaluate your PTH and calcium levels. Connecting with the rare disease community can give you a way to learn and meet other people who can relate to your personal experience. Takeda provides funding to some of the below organizations in support of efforts that include, but are not limited to: research, education, meetings/events and support. A non-profit patient organization working to educate and support those touched by hypoparathyroidism, through online resources and conferences/workshops. Founded in 1995, Thyroid Cancer Survivors’ Association, Inc. is an international non-profit organization, guided by a medical advisory council of thyroid cancer specialists, offering free support services, educational information and events to thyroid cancer survivors, families, and health care professionals worldwide. This organization works to improve the quality of life of thyroid cancer patients through education and research. Offers information about clinical trials and organizes events that support patients and families affected by hypoparathyroidism. My OnePath Patient Support Manager understands my situation. If I have questions, she makes sure I know where to get answers. Need help managing your out of pocket treatment costs? There may be options. Let’s discuss. OnePath ® is a registered trademark of Shire, a Takeda company. TAKEDA and the TAKEDA logo are trademarks or registered trademarks of Takeda Pharmaceutical Company Limited. To connect with OnePath, contact us here.